Let's Be Adventurers: A weekend of the "best-I've-ever-had's"
A weekend of the "best-I've-ever-had's"
After spending 2 weeks in California and immediately jetsetting off to Sweden for work, Christian and I spent most of the weekend inside cuddlin' and snugglin' and really just doing nothing. However, we did manage to leave our place for a few fun things! *Once the clock hit 4PM at work on Friday, the sales department whipped out a DJ, turntables and a makeshift minibar...yes I partied at work...then I made Proscuitto & Parmesan Pasta which may have been the tastiest pasta I've ever had, I cannot take credit for this so thanks Val! *Saturday night we had a little date night first with a cocktail at Canvas followed by a delish dinner at De Ysbreeker along the Amstel river...this place immediately jumped to one of my favorites in town! And the grilled artichoke may have been the best I've ever had ;). *Sunday afternoon I took Ellen's advice and Christian and I treated ourselves to brunch at G&T's Really Really Nice Place in the Jordaan (which is really, really called that too..hehehe). It was amazing. The mixture of 5 EUR bellinis, cozy decor, friendly chats with the Icelandic bartender and our Italian-British waiter and the mmmmmmm delicious food meant this was probably definitely one of the best brunches I've ever had...and I could have lounged there all afternoon. I can't wait to eat brunch there again...and now Christian is in love with eggs benedict...silly Dutch boy has been deprived that dish most of his life! Yep this weekend had plenty of best-I've-ever-had's!! *And last night, Christian and I joined some friends and danced our butts off all night to DJ Steve Aoki at Paradiso. Today is a mixture of sleep, sleep and more sleep...and enjoying my pics from California! My best friend Ink took this pic while we were watching the sun go down over Orange County a couple of weeks ago. 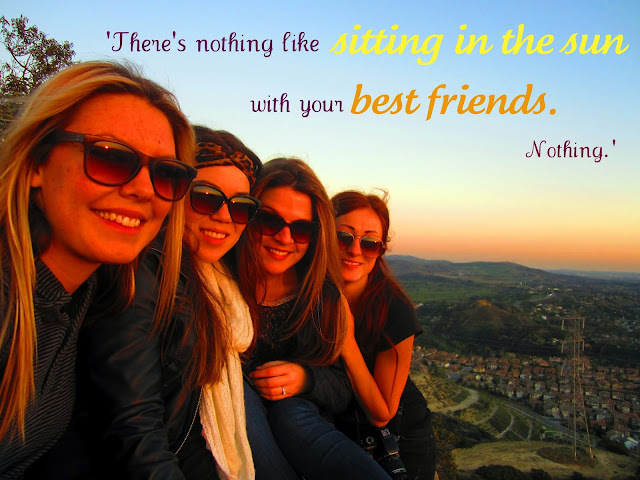 Our other friend Smitty is quite the philosophical type and said this quote about our best friend moment watching the sun go down...I loved the quote so much, it gave me goosebumps so I just had to include it too...thanks for the wise words Smit! Sounds delicious and completely amazing! Love the pictures! yay! so glad you enjoyed it. i can't wait to go back for brunch! Happy World Pillow Fight Day!